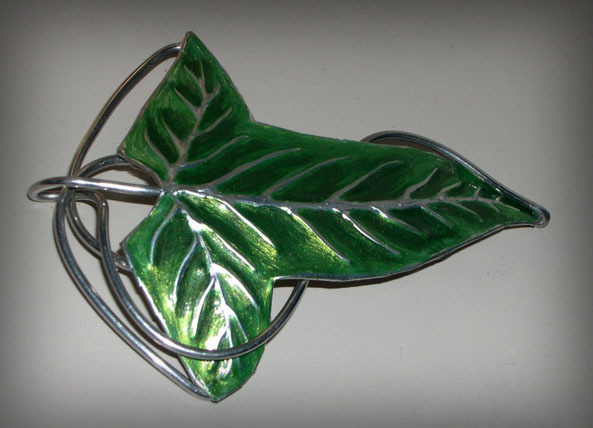 Here are instructions on making your own realistic, metal Fellowship Brooch. Firstly, print out a picture of the pin in the desired size and cut it out. Then, on the sheet of tin trace out the leaf shape (minus wires) with graphite pencil. Draw a 1/2 cm border (1/4 inch) around the traced out areas. Cut out the tin, along your outer border with scissors. To raise the veins, press the veins in on the reverse side with a ball point pen or pointed tool. Place the leaf shape face down on a stack of newspaper, then “draw” the veins, making nice smooth indents. Then cut lots of little slits into the 1/2cm border, so there are lots of little tabs all the way round (like so: |_|_|_|_|_| ). Then carefully fold the tabs round to the back, making sure to get a nice smooth edge. This makes the leaf look more weighty, and also gets rid of sharp edges. The leaf should now look like the shape in the picture you printed, with raised veins. Using gold and green acrylic paint mixed together (to make a shimmery, ethereal look) paint by hand around the veins and leave just a little metal edge showing around the leaf. Then, when the paint has dried, seal the whole thing with laquer. PVA glue painted over the top dries clear and works well too. Cut and bend the wire into the right shape, you should have two equal short lengths and one long one. Remember to add a little extra length to the end of the wires, so you can fold it around the back for gluing. Glue them on at the back with metal glue. Then glue a pin to the back, and fill the back with resin to give it weight and strength. You don’t have to fill the back with resin, but it helps. Filling with glue may work too. If the resin on the back is a gross colour then paint over with silver paint when dry. And there you go! You have your own fellowship brooch that will fool many a LOTR fan. I wear mine everywhere, and it looks like it’s real, not just costume! I made one of these as a birthday gift for my best friend, it turned out amazing! Awesome diy.